Your City Council approved a new ordinance granting Waste Connections an exclusive arrangement for trash service in Eastborough for a three-year period commencing July 1, 2006. As pointed out in previous notices to residents, if you have already prepaid for service with another provider past July you have until September 1st to make the change. Effective September 1, 2006 only Waste Connections trucks will be permitted on our city streets. Other vendors will be subject to fines after that date. The change over for the 100 new customers (200 already use Waste Connections) has not been without some problems. New customers were to identify the location of trash containers so the driver would not have to search for them. Some did and some did not! If your containers are behind a fence in a back yard you must make special arrangements with Waste Connections for placement of the carts in an area that can be easily accessed. Our agreement with Waste Connections is for weekly trash service and optional bi-monthly recycling service at greatly reduced rates. You may provide your own trash receptacles or Waste Connection will provide one 90-gallon cart. A 2nd container will be provided only if you absolutely need one. If you choose a 2nd 90-gallon cart no additional bags or boxes will be picked up. With only one 90-gallon container you may have up to 10-extra bags or boxes of trash. Please do not request an extra trash container unless you absolutely need one on a regular basis; otherwise we risk an increase in rates in the future to cover their extra investment in carts. After we get through the conversion process we anticipate smooth sailing. However, if you have any questions or complaints please call Tiffany (our customer service representative) at Waste Connections at 838-4920 ext 133. If your questions or concerns are not answered to your satisfaction, please call Barbara at City Hall. I am privileged to be Mayor of our fine City of Eastborough. Your City Council members are working hard on your behalf. Our park is looking beautiful and the rain has helped with the water levels. We are progressing with our 10-year street program organized by Councilwoman Lisa Decker. We are also in the process of changing the way we pay for fire service. Our city is in the Sedgwick County fire district and for many years we have been paying 18.5 mills to the county yearly for this service, which amounts to about $170,000. We have tentatively reached an agreement to pay the City of Wichita 11.0 mills per year (roughly $100,000) for the same service. No, this does not mean that we will be a part of Wichita. For years, the "first responder" rule has been in effect and as you are probably aware the city of Wichita always responds first, so why not pay directly to them. This savings will help to provide needed funding for the future. Some of you may be aware of recent robberies from our mailboxes. I would encourage you to consider installing a locking mailbox. We have one at our home and it serves the purpose well. At our recent Council meeting we appointed Chief of Police David Bridgewater as "Compliance Officer" pursuant to a "Nuisance Ordinance" passed by your Council. The ordinance is in this newsletter for your review. As some of you know, there are a few houses in our city which are poorly maintained and are an eyesore to our community. The Council is hoping that with new enforcement procedures, we will be able to address these problems. Your Council and I are working hard to keep our City of Eastborough a proud place to live. KSA 41-727 - No person under 21 years of age shall possess, consume, obtain or purchase alcoholic liquor or cereal malt beverage. Penalties include a maximum fine of $500.00 and suspension of driver's license. In addition, the court may order 40 hours of public service and/or completion of an alcohol abuse course. KSA 21-3610c - Unlawfully hosting minors consuming alcohol or cereal malt beverage is permitting a person's premises to be used in such a manner that results in the possession or consumption therein of alcohol or cereal malt beverage by persons under the age of 18. The penalty for conviction is a class B misdemeanor with a maximum fine of $1000.00 and the potential of up to 6 months in jail. There seems to be some confusion among some of our residents about how to contact the Police Department when the need arises. If you have an emergency situation, or need an Officer to come to your home, dial 911 and an officer will be sent to assist you. If you have a non-emergency matter, you can call City Hall during business hours (9:00am to 5:00pm weekdays) and have the clerk give the Officer on duty your message. After hours, you may leave a message on the answering machine, which the Officers check throughout their shifts and the Officer will get back with you. To keep appraised of public safety issues that may affect you, you can go to Eastborough's web site at www.eastborough.net, and click on Police Department. As the Mayor mentioned in his article, Eastborough as well as Wichita residents have experienced theft from their mailboxes. Because of Eastborough's policy of street boxes it is easier to access them. Please report any suspicion or actual theft to your police department immediately. You may want to consider a locked mailbox. If so, we suggest visiting a local hardware store or you can 'google' mail-box-security on the internet for some ideas. Cindy Burkemper replaced Kay Thurmon as Court Clerk in early May. Kay returned to her home state of Texas and we all hated to see her leave. Cindy has stepped in and made a smooth transition. She makes her home in Derby with Husband, Bryan, and 4 children. Bryan works at Boeing in the Finance Department. Cindy's son Matthew is a senior at Kansas State majoring in mathematics; David will be a senior at Kapaun Mt. Carmel; Christy will be a sophomore at Kapaun Mt. Carmel; and Danny will be an 8th grader at St. Mary's in Derby. Directing activities at this busy household was good preparation for Cindy's duties as Court Clerk. We welcome her to the Eastborough family. Take a moment when you stop by City Hall to introduce yourself and welcome her. In lieu of a Halloween party this year, we would like to invite you to the Eastborough Fall Festival on the evening of September 30th, 2006. Join us in the park for music, mingling and entertainment for all ages. Save the date on your calendar, and we will send you more details as they develop! Generous residents have donated one memorial and one art sculpture to the City. 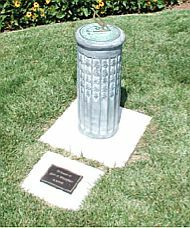 Mary Louise Knightly has donated a sundial in memory of her deceased husband John, a longtime city council member. It is located at the north end of the duck pond walk. Jean and George Angle have donated a wonderful bronze sculpture of children raising a flag. The piece of art has been appropriately placed between the children's playground and overlooking the duck pond. If you have not seen these recent additions you should take a stroll through the new park area. Many thanks to Ms. Knightly and the Angles for their generosity. Eastborough is utilizing state funding for the Road Project. The Kansas Transportation Revolving Fund (TRF) is a statewide revolving loan fund designed to "promote innovative transportation funding solutions." The purpose of TRF is to provide financial assistance to local governmental units, like Eastborough, for transportation-related projects. The Eastborough Road Project is planned for three phases. Presently, it is the intention of the council to finance each of the phases through TRF, but we are only seeking current funding for phase I. Three funding alternatives were reviewed: paying for the project out of current investments, issuing a municipal bond, or the TRF. Paying for the project out of current savings and investments would put a strain on our current financial position and place us at risk of not being able to respond in the future to a large unexpected expense. A municipal bond was an option, but we viewed the TRF as a better option because - among other reasons - it provided for competitive rates, generally lower service fees and more options including penalty free pre-payments. The TRF interest rates is set at 80 percent of the 90-day average of the Bond Buyer 20 Bond Index. The rate is variable, but is set and "locked in" on the date of the TRF Loan Agreement. Eastborough is applying for a 15-year loan, but will have the option to pre-pay. It is expected that a portion of the repayment obligation will be funded through Eastborough's Special Highway Fund which is annual revenue paid to municipalities from the State of Kansas. You have probably noticed that the waterfall feature of the duck pond has not been working all the time. Tree Top Nursery, who has the maintenance contract with the City of Wichita to maintain the park until next spring, has been working on the problem. We believe the problem has been solved and corrected. A "heat" auto turnoff setting on the pump motor was set lower than it should have been and has been adjusted. If you notice the waterfall is not working, please notify the Eastborough office. Eastborough, in an effort to control watering costs in the park, has been granted a special "Conservation Rate" by the City of Wichita. If we exceed the total allotment for the growing season, our water rates will increase substantially. Tree Top Nursery, who manages the upkeep and maintenance of the park area, monitors our water usage. Because of extreme heat, certain 'non high profile areas' mainly along the Kellog brick wall going east, have been allowed to go dormant and watering is being concentrated around the pond area. Tree Top assures us that, although much of the grass is brown, the roots are still alive and well. Plants that have not survived the heat will also be replaced in the fall. The City Council has established a procedure and committee for considering memorial gifts to Eastborough. Your council wants to make sure that donations to the city receive consistent consideration and that an overall plan for accepting and placing memorials or artwork is followed. A Memorial Committee has been established consisting of three longtime Eastborough residents. Any requests must first be submitted to the City Council for consideration. It is then referred to the committee for their recommendations and revisited by the council and a decision reached within 120 days from the original date of submission. Requests for placing gifted statuary or pieces of sculpture in Eastborough's park system may be made at any time throughout the year. Requests must be in writing to the Eastborough City Council, and should include all necessary documentation required for an informed decision as to the gift's appropriateness. Please contact Barbara at City Hall for a complete list of requirements. The Memorial Committee has established, with the help of a landscape architect, appropriate locations for additional trees, benches, or artwork for all four park areas. The City of Wichita, as part of the "East Kellog Project" provided a new park for the City of Eastborough. Care, custody, and control of the park area will be returned to Eastborough on a staged basis. Watering, as an example, is now our responsibility. The operation of the waterfall feature, irrigation system, and plants are still Wichita's responsibility. Their contractor is Tree Top Nursery. The final transfer of responsibility will be in the spring of 2007. We receive many requests from Eastborough residents to reserve the duck pond park for special events. The City will not reserve the park, but you are welcome to use it for your events with the understanding that it must be shared with other people. As a reminder, city policy will not allow for the consumption of alcohol or the use of charcoal grills. We request that you clean up the area when your event is finished. We are trying to determine the number of trash carts required for the duck pond area. By the end of summer we will have a better idea and plan to build a wooden enclosure for them in the best possible location. Climbing on the rocks around the waterfall is prohibited. Signs that were posted prohibiting rock climbing have been unlawfully removed. Many of these rocks are unstable and dangerous to climb on and also protect part of the electrical and circulation system of the pond. Parents, help us out on this! Finally, while the Duck Pond is the focal point of our parks, we will be turning our attention to the other parks around the city. Landscaping and tree planting will be on the horizon. The four other parks don't get the traffic or attention, but they are still a part of what makes our city beautiful. If you have any questions, suggestions or comments about the parks, please call 689-8678 or e-mail me at shawn.devlin@eastborough.net. Who doesn't love our beautiful park? 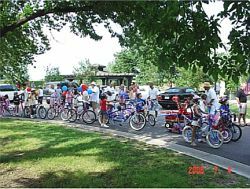 We're experiencing lots of visitors from both Eastborough and Wichita alike, as the venue is the perfect place for a walk, bike ride, or a romp on the play equipment. And the ducks! It's been quite fun to see the baby ducklings hatch and grow to adolescents and adults. And while technically our mallards are "wildlife," they've become somewhat domesticated and are not afraid of the humans who frequent their home. Bob Gress, naturalist of the Great Plains Nature Center, assured me that feeding the ducks is an "activity for human enjoyment" and will not harm them as long as we feed them good grains (various seeds such as corn, wheat, barley, and sunflower seeds). While bread doesn't harm them, it does not provide much nutritional value and is not the best choice in winter months. Please avoid feeding ducks human "junk food". Feeding the ducks has provided me with so much enjoyment that I've started referring to myself as the "Eastborough Duck Lady." The ducks recognize me when I drive up, walk or bike to the pond and flock to me. I've even been at the pond raking up their mess (mostly by the geese, not my ducks) and disposing of it. If you have an interest in knowing more, please contact me at 683-8601 - it might be fun to form an informal "Friends of the Ducks" committee to help educate others who visit our lovely park. 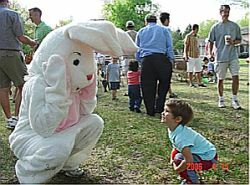 Fun was had by all at the annual Eastborough Easter Egg Hunt in the park. We had lots and lots of Easter Eggs, Easter Egg Hunters, parents, refreshments, animals to pet (including cute little bunnies, goats, and colorful baby chicks) and animals that the kids tried to sit upon and ride (mainly two well behaved horses). We also had a very special visit by the Easter Bunny who was a big hit with everyone! Thanks to all that helped organize to put on this year's event! As we begin our street renovation project, we thought it was the right time to bring up the topic of curbing on the west side. The city council called a town meeting in April and invited all the residents who live north of Douglas and West of Woodlawn. The purpose of the meeting was to evaluate how much interest there was in adding curbing. This is a very large project and the costs at this time are unknown; residents expressed enough interest that the council voted to hire the engineering firm, MKEC, to perform a street survey. Once complete, we will have a better idea of the entire cost of the project. For the last year or so we have been working to establish a long-term plan for street renovations. We hired Doug Dagg, who has over 20 years experience in street maintenance, to help us develop a 10 year plan. The purpose of the plan is to build a schedule that would maintain our streets in good condition, and likewise to establish a plan to pay for it. We are embarking on Phase I of what will be a multiple phase project. The streets that will be resurfaced first are those identified as being in the worst shape. Requests for bids were taken in early 2006 and Cornejo and Sons, Inc. was the low bidder. The first phase of the plan will likely be implemented this summer pending approval of a $235,000 loan from the Kansas Transportation Revolving Fund (TRF). Our accountant has advised us that the TRF is the most economical way to borrow the money. All residents impacted by the street maintenance will be notified in advance.